Hailey and I at San Diego Humane Society oh so many years ago! Now it is a memory from the past, but at the time, I was definitely in the present with this feline beauty. If you are wanting to have clearer communication with your animal friends, I encourage you to be in the present moment. Animals are great teachers for us humans because they are focused more fully in the present moment. We tend to divide our awareness, attention and energies between the past and future and hopefully at least some in the present, as well. Why do we spend time in the past? Perhaps we are troubled by a past experience and it is keeping us from fully moving forward in our life. Maybe there is someone we are having a tough time forgiving or letting go of. Possibly we are struggling with forgiving ourselves for something that we have guilt, remorse or shame about from the past. Another possibility is that we are stuck on an experience or time period that we felt was more enjoyable than our present reality. There can be a number of things that can draw our attention to the past. Most of us find ourselves at times thinking about the past, dwelling on memories, reliving or even regretting aspects of our past history. What happens when we spend time with our attention focused in the past? We are more likely to experience heavier emotions and feelings of apathy, depression, grief and unhappiness. The more we are in the present moment, the lighter and brighter we will find our energy and perspective to be. We may also find ourselves focusing on the future. Perhaps there are things you want to create and you move your attention to the future, fantasizing about what life would be like with those additions. Or maybe you are worried about what may or may not happen in the future. You may then go into the future in an attempt to protect yourself or others and control the potential outcome of situations. While this may be a common practice for some of us humans, no matter how hard we try to master this plan, it doesn’t work! You don’t have to “go” to the present to be aware of it and make plans that will affect the future outcome. You can remain with your attention in the present, while being aware of the future. When you have a lot of your attention and energy in the future, you are more likely to experience fear, nervousness, anxiety and even stress. Remember, your body can only be in one place, the present moment. So when you have your attention in the future, you are not at home, in the present with your body. It can grow afraid when you are not present with it to take care of it. You are spirit. As spirit, a spiritual being, a soul, you can be wherever you put your attention. You can focus in the past, present or future. You can be in another city, state or even country, just by thinking about it. However, your body can only be in one place, right here and right now in the present moment. When you are out of the present moment visiting elsewhere you are not able to be as much in charge of what you are creating through your body. You don’t have as much control of what you are manifesting into the physical reality. You are more likely to be influenced by others and invaded by others’ energy, ideas, opinions, emotions and even pain. Your body can become a vessel for someone else, instead of for you. Have you ever said, “I don’t feel like myself today.” Well, you probably weren’t! The more present you are with your body, the more you can own it for yourself. The more of your energy you can bring into your body. The more present you are with your body, the less afraid your body will feel. You will be less likely to feel stress or depression. The more you, as spirit are in the present moment with your body, the calmer you will feel. The more in charge you will be. The more confident and empowered you will become. Your animal friends, nature and other aspects of the physical world including the sensations, experiences and feelings of your body can help draw your attention, as spirit more to the present moment. Enjoy! Your point of power is now. Right now, in the present. When you are in the past or future, you deplete your energies and lessen your ability to use your power, your energy and information in the present. The more in the present moment you are, the clearer your communication will be with yourself, your body, your God and your human and animal friends. The form of meditation that I practice and teach helps you to be more in the present moment. The easy to use, powerful, meditative, visualization techniques help you, the spirit to work more in harmony with your body. They assist you to be more present and more consciously aware of what you are creating and manifesting through your physical body. The Meditation Club that I facilitate allows me to share this meditation information with anyone, anywhere. As a participant in the Club you will receive a new, recorded, guided meditation each month to help you in your life. Learn and practice meditating on your schedule in the privacy of your own home, office, car or public bathroom stall. Really! Because you can meditate anytime, anywhere! Discover techniques to help reduce stress, anxiety, depression, pain and uncomfortable emotions, as well as consciously make the changes you want to make in your life. Let go of the past, come back from the future and be more fully present with the help of meditation! Meditation has helped me to feel better, create changes, have more confidence and be happier in my life. There are many things that are important to me. Just as there have been many experiences that have played integral parts and turning points in my life. One was the discovery of meditation. Not just meditation, but a particular style of meditation that helps the soul – the spiritual being – work consciously with the physical body. I was blessed enough to learn this form of meditation when I was 18 years old. With that said, please know that it is never too late to learn to meditate! I believe we are presented with information when we need it and are ready for it. At the time that I was introduced to this form of meditation, I was headed down a very dark road. I was drinking alcohol to the point of blacking out, I was often in a state of depression and although I had grand ambitions, I lacked self-esteem. I wanted to accomplish certain things in my life, but didn’t believe that I could. My fears, doubts and emotional pain formed a sad state of reality for me. I wondered if I would ever be happy. There are many forms of meditation. Instead of staring at the light of a candle outside of yourself, as I was taught as a child, the style of meditation I practice and teach uses techniques to help you get in touch with your light within. When I began the Meditation I class at the CDM Spiritual Center, I really didn’t know what to expect. I had heard the term meditation, but my previous introduction, as a young child didn’t resonate with me. I was bored with the idea of staring at a candle and lost interest soon after trying to sit and focus. I didn’t “get it” at that point in my life. While I was drawn to spiritual practices including attending church from the time I was a young child, I didn’t find anything that “clicked” for me. I have always had a strong awareness of God and the spiritual realm. This helped me to know that there was more than what we physically could see. Unseen, spiritual presences have always been very real for me. They are real. We just don’t live in a world that usually validates them as such. Everything is energy. You are energy. Your aura, the energy field around you is energy. Your body is energy. Everything is energy! Although I didn’t have many expectations of what was then presented as an eight-week class, I was as curious as an apathetic teenager could be. Before talking with the meditation teacher and signing up for the class, I received an aura healing. This was an interesting experience. I learned that day that your aura is the energy field around you and that an aura healing is a non-touch healing. It was and is a cleansing of your aura, chakras and energy system. I watched the person giving the healing walk around me assisting me to move energy and let go of whatever energy I was ready to. I remember feeling some tingles, which was me experiencing energy being stimulated and moving. The Meditation I class I took changed my life. I love sharing this information with others. Nothing is for everyone, but I can’t help but share with others what has helped me. Maybe this form of meditation will help you too! The day of my first class arrived! I was in the class with another young woman, who was about six years older than me. We instantly liked each other and got along great! I thought the teacher was fun and validating too. I loved everything that I was learning. It was all so real to me! All of the techniques including grounding, centering, releasing and running energy made quite an impact on me. I began to feel better, lighter and brighter. My depression and apathy starting changing into enthusiasm and joy. I was becoming a happier person. The changes that were occurring within me were truly phenomenal and it started happening in a very short period of time! The changes I was making internally led to changes externally in my physical reality. As I mentioned, I started to feel better and became happier. I additionally quit drinking cold turkey. I changed how I spent my time and who I spent it with and started becoming excited about life. Truly excited! If I was to sum up what that meditation class gave me, it was hope. It showed me there was a different way to experience life. I now had tools to help me out of any situation. Techniques to support me throughout my life, whether dark or light, happy or sad or simply the day-to-day experiences that we all have. I’ve spent this blog post sharing with you the important role that meditation has played in my life. The title of this blog post is, “The Most Important Thing.” You are probably thinking that the most important thing to me is meditation. While it is extremely important and an integral part of my life, if I am to choose the most important thing that I have ever learned, or in actuality, relearned, is that I am spirit. This concept was introduced to me at CDM Spiritual Center where I learned meditation. The idea that I am spirit was revisited, confirmed and experienced first-hand in every meditation class. Why is this the most important thing? Have you ever learned this? Do you understand what it means? I am spirit. You are spirit. We are all spirit. Whether we are housed in human bodies, cat, dog, bird, rabbit, fish, lizard or giraffe bodies. We don’t have a spirit or soul. We ARE spirits. We ARE souls. There is a difference. Nor do we become spirit when when our body dies. We already are and always will be, spirit. We are NOT our bodies. Our bodies are our vessels to manifest through as spirit, spiritual beings, the souls that we are. It is through meditation that I came to fully understand what it means to be spirit. I continue to strengthen my relationship with myself, as spirit and my physical body through meditation. As I get to know myself and my uniqueness through meditation, I am also able to use the meditative, visualization techniques to let go of that which I no longer want. This process makes more room for what I do want in the present. Physicists have proven that everything is energy. When we let go of energy we don’t want, we make more room for energy we do want. Whether I want to let go of pain, fear, doubt, energy from the past, uncomfortable emotions or change habits, patterns, beliefs or simply enjoy life more fully, these easy-to-use, powerful meditation techniques can help. Out with the old, in with the new! I wanted to write this blog post because I love sharing with others what has helped me. Meditation and the awareness that comes with it has helped me and continues to help me every day. Many of you have heard me say this and I may have even recommended that you consider adding meditation to your life. But, as I mentioned above, if I were to choose one thing above all else as the most important thing that I have learned in this lifetime and that I want to share with others is that I am spirit. You are spirit. We are all spirit. Again, you are not your body. Your physical body is your vessel, your vehicle, your temple, the home for you, the spirit. The spirit that is you. The spiritual being that is you. The soul that is you. YOU are spirit! Are you on my email mailing list? If you are, you previously learned that I am no longer doing solely animal communication and pet psychic readings. In that same newsletter I also mentioned that if I do offer them again, it will be in a different way. After several months of meditation and contemplation, I will be refocusing and working in areas where I have the most experience. I started my energy work, healing and reading with people many years ago. It was later that I formally included animals in my practice. I have been working with animals since 2007. This year, I will be going back to my roots! In my service to people, I will help animals because the happier the person, the happier their animal friends will be. By you getting more in touch with yourself you can be more present in your life, including with your pets. Instead of just answering questions, a session with me will start with an aura reading. Your aura is the energy field around you and your body. During an aura reading, I look at the seven main layers of your aura. Following an aura reading you can ask questions about yourself and and your life, which can include your animal friends. 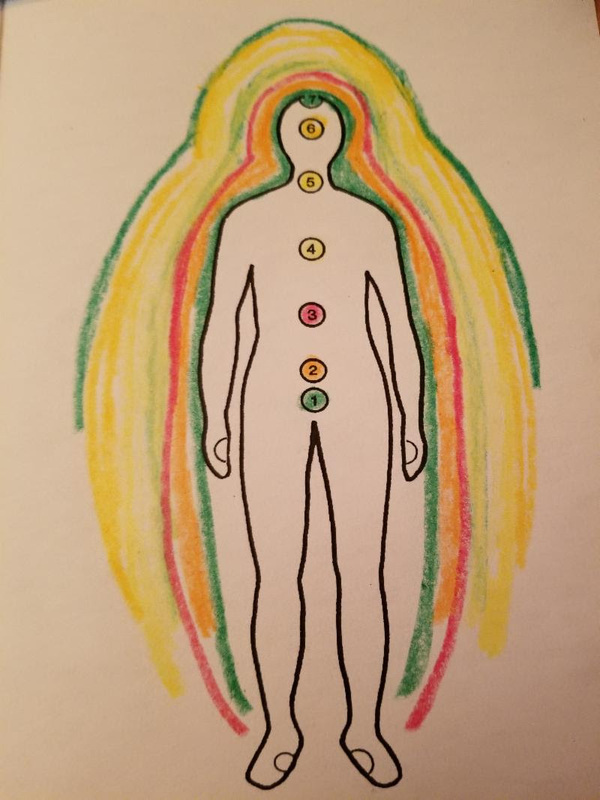 Below is a drawing I made to accompany an aura reading I received a couple of weeks ago. Yes, I get them too! I received my reading at CDM Spiritual Center in Everett, Washington. It was amazing and so helpful. It reminded me how beneficial receiving this information can be. We are often so close to situations in our lives, especially things we are emotional about. It can be helpful to have a neutral, outside observer to provide insight. Plus, aura readings are really fun! I do rose/spiritual awareness and past life readings also. An aura reading is a personalized, non-judgmental overview of what is going on with you and your life situations. This includes how you relate to the physical and survival issues, your emotions, communication, clairvoyance and more! My intent from the beginning of when I started offering readings was to help people to get more in touch with themselves and their own information. My goal was to help humans to validate, accept and use their own abilities to communicate with animals. I believe that returning to working more predominantly with people will allow me to do what I originally intended to do. Your animal friends will still be involved! In fact, they can get aura readings too! All living things have auras! I also still offer nutrition consulting for dogs and cats and teach meditation techniques to humans. Speaking of which, I will be starting the Meditation Club again very soon! What if I told you there was a magic pill that would help you create the life you always wanted to live? You could step into this life, leaving all of your worries and hardships behind. An existence with less stress, more fun and fulfilling lessons along the way. Would you want to take that pill? Well, I don’t have a pill. I actually don’t even keep aspirin or ibuprofen around. I do however, have a system that can help you to reduce stress, increase the lightness and brightness around you, as well as enable you to move through life’s lessons with more comfort and ease. What might that be you ask? Meditation! While there is a time and place for everything, including medication, switch the “c” to a “t” and you can find ways to feel healthier and more vibrant and make any changes that you want to make within yourself and in your life. There is a catch though. You have to do it. There are many forms of meditation. You may enjoy sitting quietly in reflection, looking at the ocean or walking in nature. Perhaps music helps you find a sense of peace or painting a picture is meditative for you. Focusing on your breathing may also help you to be more at ease. Whether you like a variety of approaches or you have a favorite, slowing down to take time for yourself can be so beneficial. While I enjoy watching the rhythm of the waves, hiking in the woods, listening to music and painting, the main form of meditation that I practice and teach works with energy. It utilizes visualization techniques to help be more grounded, centered and focused in the present moment. These energy tools are a way to consciously make changes in your reality. Whether changing habits, enhancing communication or increasing your awareness of yourself, as spirit and your body. If you are interested in learning more, feel free to call me at 360-601-4358 or email me at sindi@apetpsychic.com. In addition to in-person classes and group, guided meditations, I have created a way to help share this information with anyone, anywhere. It’s The Meditation Club! Learn to meditate at your own pace, on your schedule, in the privacy of your own home. Find out more on my meditation website at this link. You can join at anytime and cancel at anytime. Learn to meditate for just $10 per month. Join The Club! Hope to talk with you soon! Meditation has helps me to feel better and be more present and content in my life. Maybe it can do that for you too! Why wait? Meditate! While I currently live in Oregon, I receive a lot of requests from San Diego and other areas in California. I lived in southern California for eight years and so there is a lot of information about me online from my work there. People that have received readings and animal communications from me while I lived there still contact me too. In relation to the services I offer, it doesn’t matter where I physically live. Or where you live either. I offer long distance sessions for anyone, anywhere. It is a convenient way to receive the help and information you are seeking. Remote psychic readings, energy healings and animal communication sessions are also the most cost effective option. If you happened to have seen the last issue of Ladies Home Journal with Maya Rudolpf on the cover, you may have seen the article on pet psychics. I was one of three featured. Excerpts from readings that were given to the article’s author were included. Mine was a long distance session. The writer was in California and I was from Oregon. If you happen to read the article you will learn more about the work I do. It will also support the fact that yes, long distance psychic readings and animal communications do in fact work! Physicists have long since proven that everything is energy! There is no time or space with energy. By tuning into energy using my abilities of clairvoyance, telepathic communication and other skills, that are often referred to as “gifts” I am able to obtain, interpret and relay information to humans and animals, alike. While these abilities are “gifts”, they are gifts that we all have. What makes me different is that I have been consciously developing these capabilities for over thirty years. Additionally, I have always been aware of the spiritual realm. Since I was a child I knew there were spirits that were around us, including scaring me under the bed! I could tell when someone was lying to me or keeping information from me. I also was aware of communication from my pets, including when my animal friend passed on. These awareness and abilities I gladly share with you. I want to help you, whether you have animals in your life or not. I offer support to humans and animals, both wild and tame and in in any living situation. This includes animals in homes, on farms and in the wild, as well as those being cared for in shelters and with rescue organizations. Did you know I also can help animals that are in captivity? Along with giving you information that is obtained through my readings and other sessions, I teach meditation techniques that can literally change your life. I look forward to helping you however I can. I can be reached via email at sindi@apetpsychic.com or by phone at 503-741-1344. If you would like to text me, please use 619-797-0705. My 503 number is for calls only.